For the 2019 AP exams, students at Harmony School of Advancement will be registering online. This registration will take a few minutes and can be completed from any computer with internet access. Apply Today! Online exam registration will begin on Mon, Dec 17, 2018 at 12:00 AM and end on Fri, Mar 1, 2019 at 5:00 PM. In order to register, students should click on the link provide on the school website or visit www.TotalRegistration.net/AP/443598. To complete registration, you must answer all of the required questions. Registration is not complete until students have printed the pdf of the confirmation page that is provided at the end. I strongly recommend that parents and students are both present while registering to ensure that the correct exams are ordered. 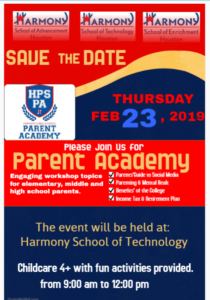 Harmony School of Advancement is excited to offer families the convenience of paying exam fees online at the time of registration. Please be sure to have a credit card or debit card available before beginning registration. Mon, Feb 25, 2019 at 12:01 AM – Registrations and payments after this date will incur a $10 late fee per exam. Mon, Mar 4, 2019 at 5:00 PM – Registrations that have not been paid will be canceled and exams will not be ordered. Fri, Feb 8, 2019 – Last day to cancel an exam and receive a full refund. Thu, Feb 28, 2019 – Last day to cancel an exam with a cancellation fee of $25.00. Please contact Mrs. Katrina Brown, knbrown@harmonytx.org , if you have any questions. https://harmonypublicschools.network/hsadvancement-new/wp-content/uploads/sites/110/2019/03/hsadvancement-300px.png 0 0 Central Office https://harmonypublicschools.network/hsadvancement-new/wp-content/uploads/sites/110/2019/03/hsadvancement-300px.png Central Office2019-02-04 15:37:552019-02-04 15:43:13We're Hiring: Houston Job Fairs!